It is a type of Benign Tumor of Epithelial Tissue origin. The Squamous papilloma is associated with Human Papilloma Virus (HPV) types 6, 11. This Tumor is of low virulance i.e it is not contagious. The Papilloma shows Exophytic growth. Numerous small finger like projections which result in lesion with a roughened, verrucous (or) Cauliflower Surface. It is a well circumscried tumor. The tumor is Pedenculated (Mostly) or Sessile (sometimes). 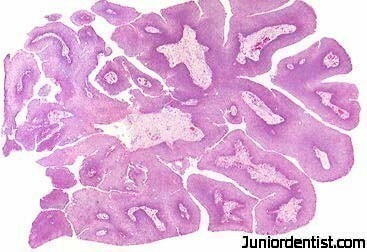 Charecteristic feature: Many long thin, finger like projections extending above the surface of mucosa. Each finger like projection is lined by Stratified Squamous Epithelium and contains a thin central connective tissue. The spinous cells proliferate in a papillary pattern. Koliocytes- HPV altered cells may or maynot be seen. Chronic inflamatory cells are seen. Surgical Excision incleding the base of mucosa into which the pedicle or stalk is inserted. If the Exicision is done properly then Recurrance is rare. Thanks for the comments and that was really helpful. One of my uncles was diagnosed with “Squamous Papilloma” in the mouth. 1. What would be the reason that he might have got it (Water, Environment, Food, Oral Hygiene etc.). He is a very religious person and has a healthy lifestyle. 2. The doctors are recommending 4 shots, costing 15,000 rupees for each shot. Is this needed or is this curable? 3. You said it’s transmittable. What precaution must he do so that he doesn’t spread it to other family members? 4. He is based in Chennai, Can you recommend any of your friends that we can get opinion on this one.